A man who started his career peeling potatoes for the RAF ended up leaving £2m to charity. 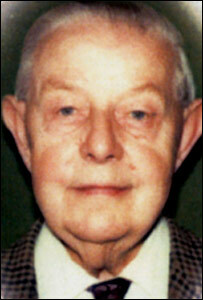 But John George White, 96, of Bristol, left nothing to his nephew in Wales who helped him through his final illness. He left £500,000 to a Surrey school, a similar sum to his local church, and split £1m between a children's charity and a special needs trust. The boarding school in Reigate said Mr White had no prior contact with them and the donation was a complete shock. The millionaire did leave £40,000 to his family, which is being used to set up an educational trust fund to help his great great nephews and nieces. Head teacher of the Royal Alexandra and Albert School, Paul Spencer Ellis, said the school, a state-maintained, church-aided boarding school, was trying to find out who Mr White was, and why he left them such a generous gift. He said: "We have no idea why he left this money to us. "Our first guess was that he had been a pupil here, but that wasn't true. "We would be fascinated to know why he chose us." The school now plans to name a building after Mr White and is using the cash to fund more places for vulnerable children. Mr White's closest living relative, Richard White, of Newport, South Wales, who received nothing at all, said: "It was his money and he could do what he liked with it." The 67-year-old, who worked in the construction industry before he retired, added: "I'm not poor, but I'm not a millionaire. It would be nice to be one but I don't begrudge him. He liked to surprise people." Mr White began his career working for the RAF, and went on to become head of catering for its African campaign. In civilian life, he became a director of Cadena, which initially ran two cafes, but he helped it expand into a national firm, turning failing restaurants into profitable concerns. After Mr White retired in 1961, Cadena sold out to Tesco - the move made him his fortune largely because Tesco paid him partially in shares and his wealth soared. But he lived a modest life, spending much of his retirement in the Regents residential care home in Keynsham. One neighbour, Jean Watts, said she had no idea he was a rich man. Would you make a living will?